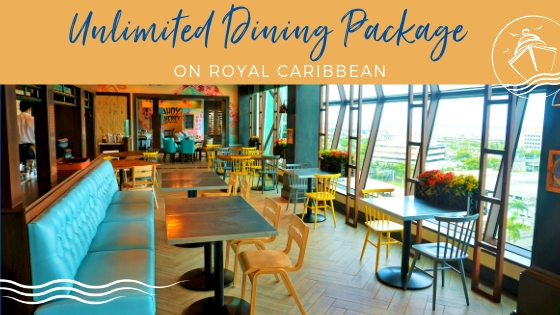 As the current record holder of largest cruise ship in the world, Harmony of the Seas delivers plenty of onboard activities for cruisers of all ages. 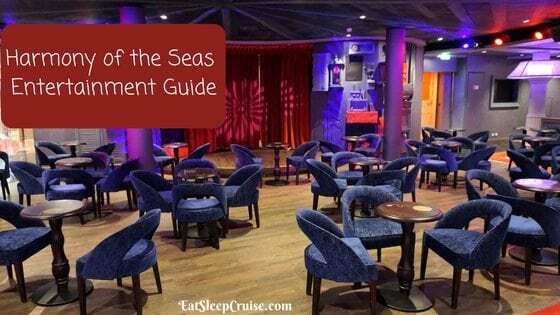 In fact, there is so much Harmony of the Seas entertainment that trying to fit everything in during your cruise could be a challenge. 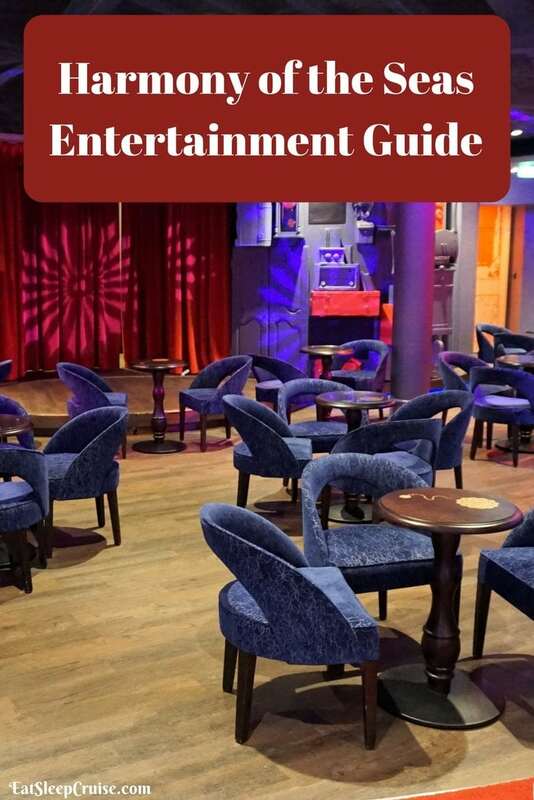 That is why we have put together this Harmony of the Seas Entertainment Guide. Learn more about all of the one of a kind nighttime entertainment options and start planning now so you never miss a show! Included in the Harmony of the Seas Entertainment line-up are 6 shows that are available for pre-booking. These include The Fine Line, Grease, Standup Comedy Show, Headliner Show, 1887: A Journey in Time, and Columbus, The Muscial!. It is recommended that you reserve these shows as they will fill up quickly. 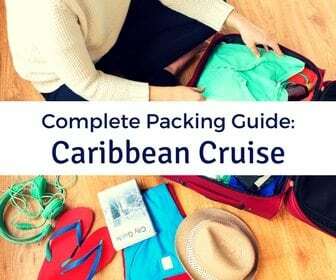 Reservations can be made prior to boarding using the online cruise planner (approximately 90 days prior to sailing) or immediately upon boarding the ship. Only those with reservations will be scanned into the shows approximately 30-45 minutes prior to showtime. If you do not have a reservation, you will need to wait in a standby line and are not guaranteed admission. 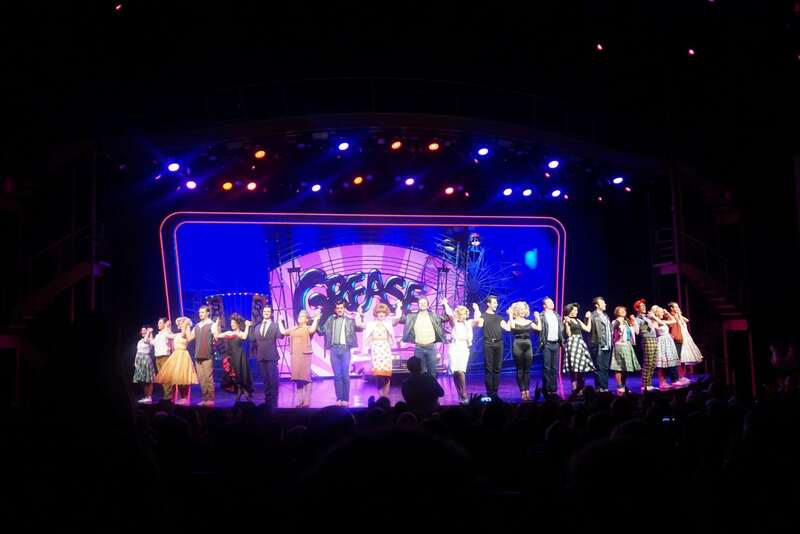 This 90-minute Broadway production show is offered in the main theater on Harmony of the Seas on Day 1, Day 2, and Day 3 of the cruise, with evening time slots available. On our sailing, there were no matinee performances of Grease. Grab your leather jacket and poodle skirt, journey back in time to the 1950’s era, and get ready for an unforgettable show. With rock and roll favorites like Summer Lovin’ and Greased Lightnin’ and a star cast of performers, you might just feel like you are reliving your high school days at Rydell High. 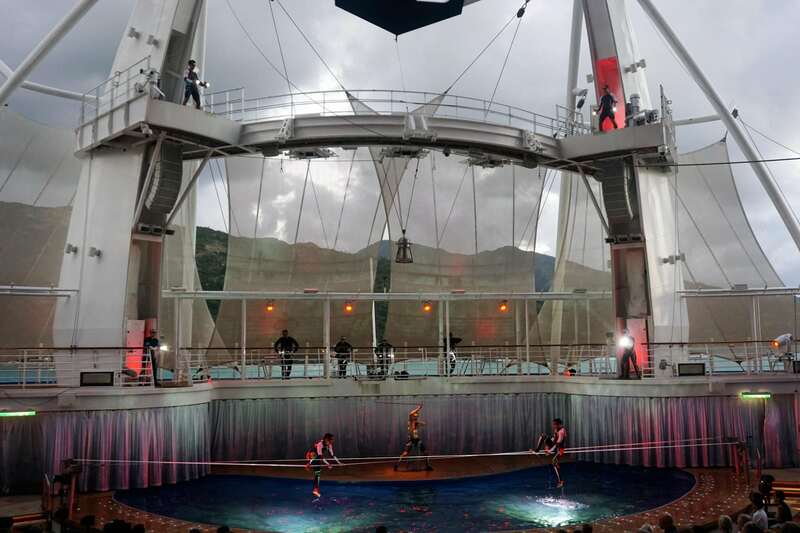 This one of a kind diving show takes place outside in the Aqua Theater located on the Boardwalk and is offered on Day 1, Day 2, and Day 3 of the cruise at 9 pm ad 10:45pm on Day 1 and 2 and at 7:30pm and 9:30pm on Day 3. 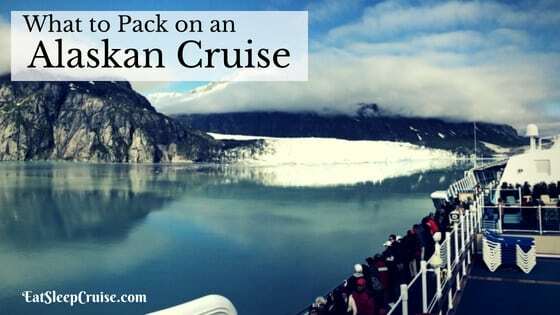 This show is weather permitting and may be cancelled and/or altered due to weather conditions, as was the case on our cruise. Official run time is 50 minutes. The Fine Line takes aerial acrobatics to new heights in an immersive 360-degree experience. 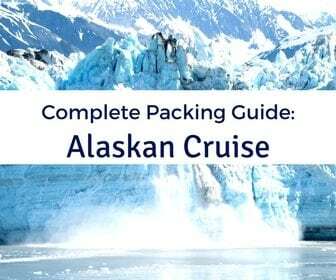 You will witness Olympic class divers, acrobatic and high wire feats, and synchronized swimmers perform in the deepest pool at sea. The precision and athleticism of these performers is breathtaking, making this a must-see show. 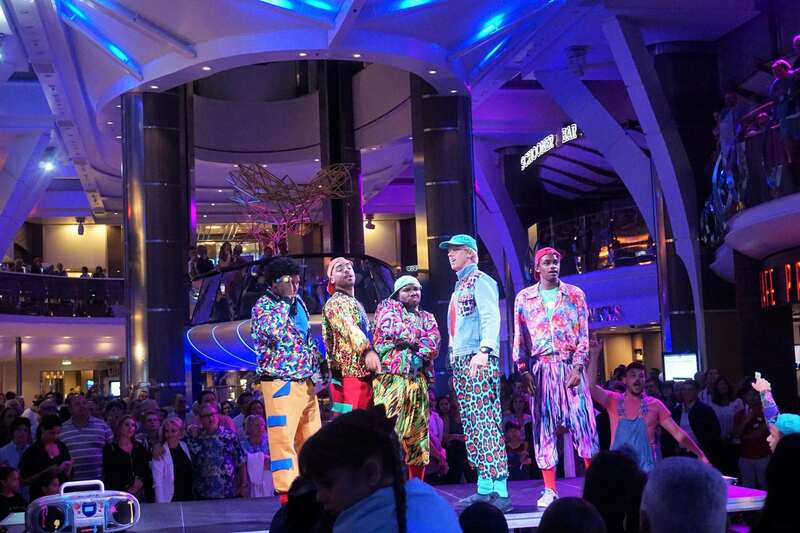 Given the use of special lighting, this show is best viewed in the dark, but unfortunately, our original performance was rescheduled to a 5pm showtime later in the cruise. 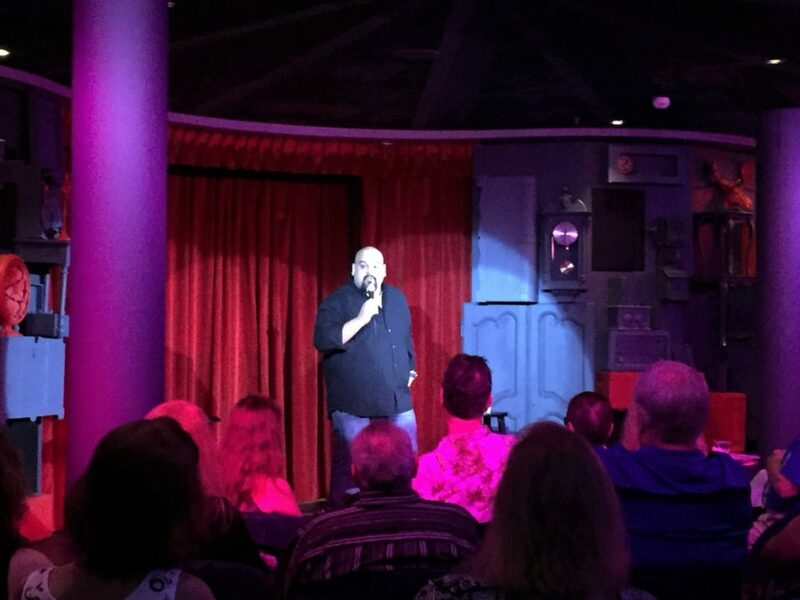 The comedy show on Harmony of the Seas in held in The Attic, a somewhat larger venue than its counterpart Comedy LIVE on the other Oasis-class ships. The Comedy show is available most nights of the cruise at 9pm and 10:30pm. These shows are virtually the same every night, so you are only allowed one reservation. Though the venue is bigger, seating capacity is still limited, so these reservations do book up quickly. This approximately 50-minute show features a quick set by the emcee, Simeon, followed by longer set from the comedian. On our cruise, we laughed along to Nery Saenz. In our opinion, Simeon was much funnier than the main act. 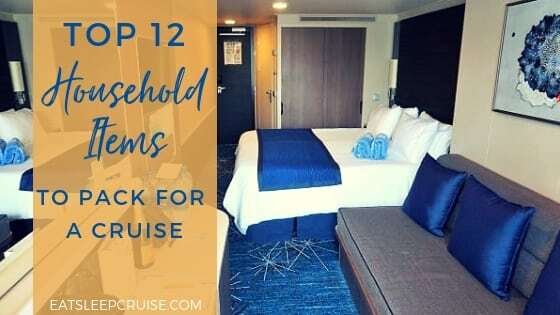 If you are unable to get a reservation or want to see the show again, you can wait in the standby line, or there is a similar show that does not require a reservation that is held in the main theater on the last evening of the cruise. The Headliner act will vary from cruise to cruise, but the Headliner show is usually offered on Day 4 and Day 5 in the main theater. 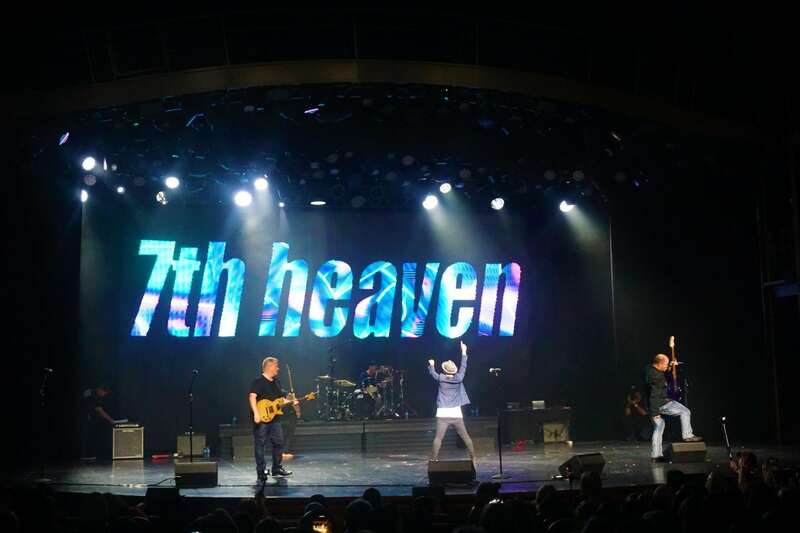 On our recent Harmony of the Seas cruise, the Headliner act was 7th Heaven. This act was part of a special Chicago Music cruise that was onboard during our sailing. Known for their famous “30 songs in 30 minutes” featuring popular melodies from the 70’s and 80’s, this group put on 3 completely different performances over the course of the two nights. Enjoying the first performance so much, we headed back to see another set the following night. The Royal Theater was packed with fans rocking out to Journey, AC/DC, Bon Jovi, and more! Unfortunately, you will probably not get to experience this band during your cruise but hopefully an equally entertaining act. This Royal Caribbean production show is offered in the main theater during the later part of the cruise, on Day 6 and Day 7. Columbus, The Musical! 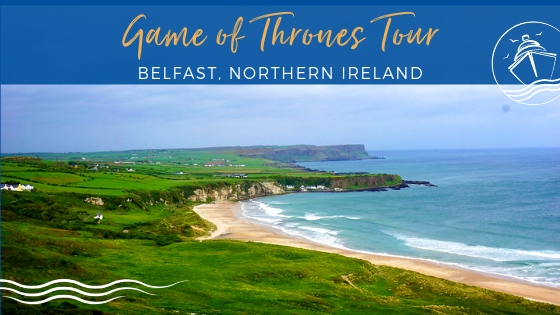 is a unique comedic production created in the spirit of Monty Python’s Spamalot. This production tells the story of Marvin, Christopher’s luckless distant cousin, who sets out on a journey to claim his own place in history. Through the use of imagination, digital imagery, and humor, this show captivates the audience for the duration of its 50-minute runtime. This is a must-see show, so be sure to secure your reservations. 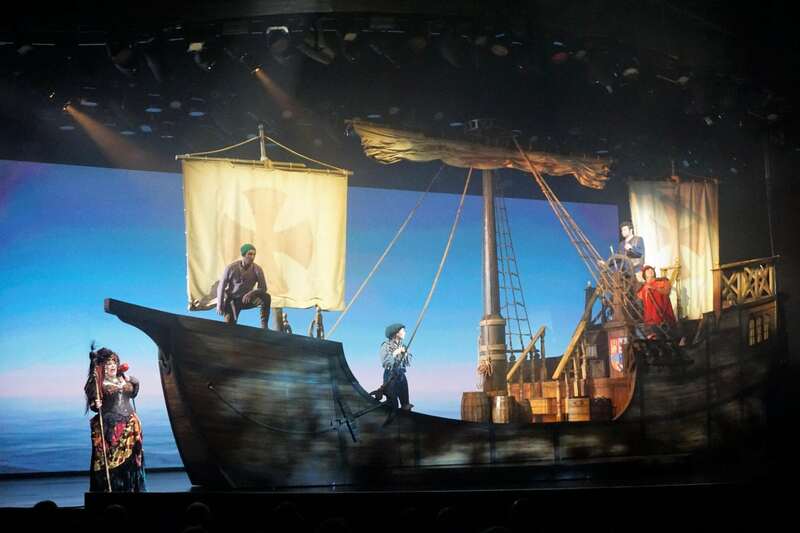 Harmony of the Seas Entertainment – Columbus, The Musical! This ice show takes place in Studio B on Day 1, Day 2, and Day 6. The year is 1887 and the backdrop Paris, as you travel along with Juliet on her journey of love and adventure. 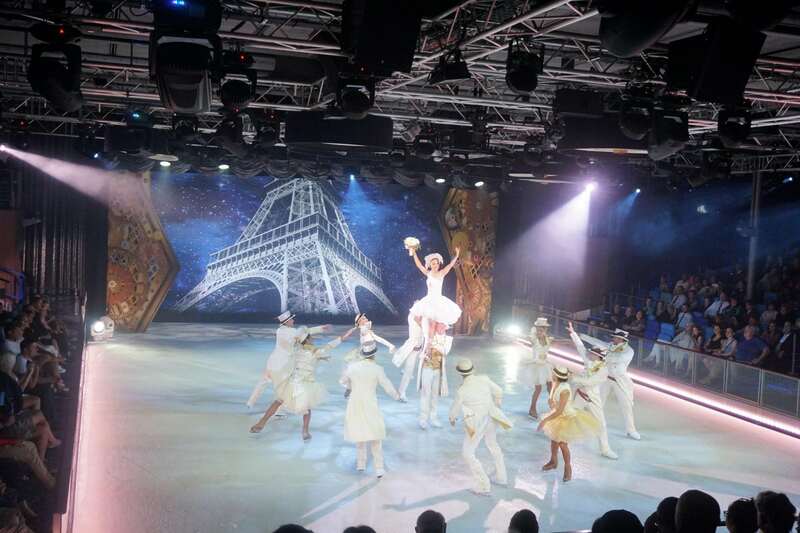 With a cast of talented skaters and digital technology, this ice show notches out the edge in comparison to other Royal Caribbean ice shows. When you think of how amazing it is that these skaters can perform flawlessly on a moving ship, then combine that with the talented featured “bubble” performer, there is no reason why you shouldn’t attend this show. 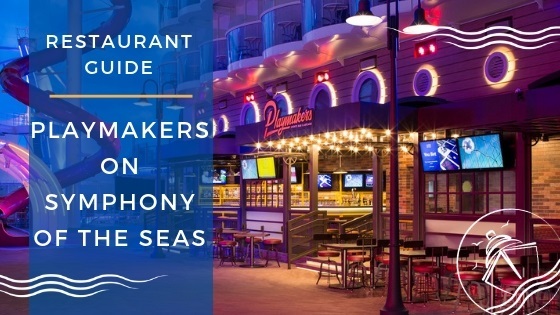 Even though the 6 shows listed above are the only Harmony of the Seas entertainment that you are able to reserve, rest assured that there is plenty of other nighttime entertainment for you to enjoy. From live music in most bars and lounges to plenty of game shows, trivia, dance classes, outdoor movies, karaoke, and more. Some of the highlights include: HUSH Silent Party (Day 3 at 11:45pm), Love and Marriage Game Show (Day 5 at 7:45pm), 90’s Street Party (Day 6 at 10pm), Battle of the Sexes Game Show (Day 4 at 10pm), Red Party (Day 4 at 11:15pm), The Quest (Day 5 at 11:30pm), White Party (Day 6 at 11pm), and the Let’s Celebrate Parade (Day 7 at 7:45pm). 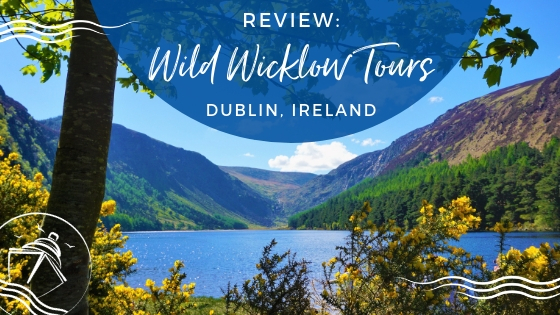 There is also an additional Aqua Theater show Hideaway Heist that is usually scheduled for 2 time slots during the cruise- though it was cancelled on our sailing due to weather conditions- and an additional ice skating performance iSkate that is also offered during a few time slots during the cruise. Hideaway Heist and iSkate are first come, first serve seating. 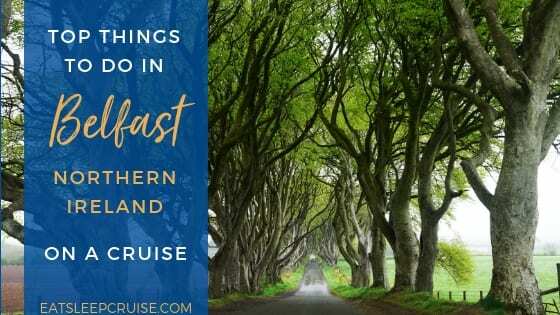 Note: Show times listed in this post were accurate for our January 7, 2017 Eastern Caribbean cruise but are subject to change at any time. Show times may also vary for different itineraries or may be altered due to weather conditions. 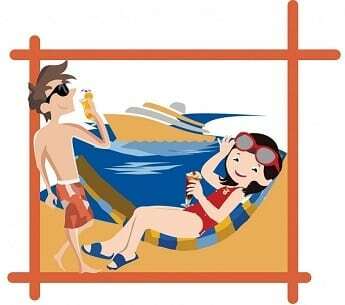 Do check your online cruise planner and cruise compass once onboard for availability on your cruise. 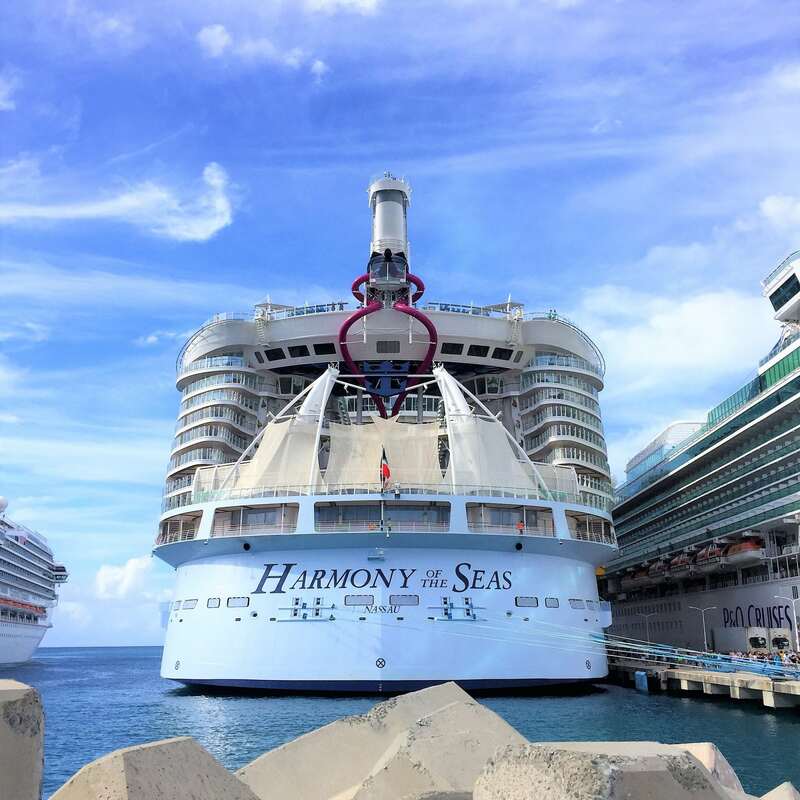 Have you sailed on Harmony of the Seas? 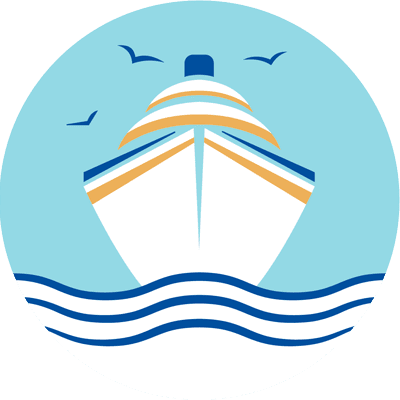 What were your favorites among the Harmony of the Seas Entertainment? 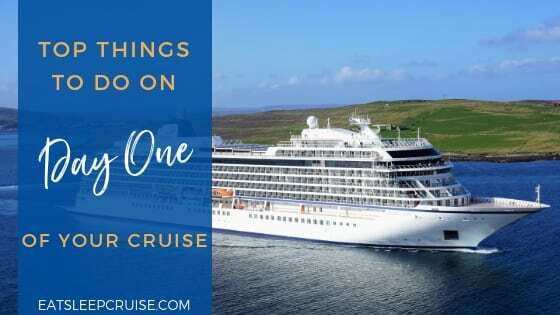 Drop us an anchor below to let us know what shows you love on a cruise.